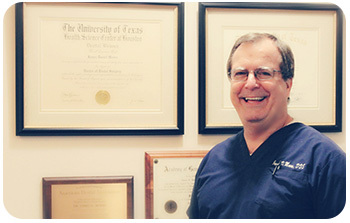 Dr. Jim Moers, has been practicing general and cosmetic dentistry in Houston, Texas for over 35 years. He holds a Doctorate of Dental Surgery from the University of Texas Dental School at Houston as well as a B.S. in Mathematics from Tulane University. Growing up in the University Area, he was happy to return to the area to start his initial practice, improving the oral and overall health of fellow Houstonians. Being committed to lifelong learning and providing superior care, Dr. Jim Moers has accumulated hundreds of hours in continuing education, awarding him the title of Fellow at the Academy of General Dentistry in 1994. Wanting to advance his education with advances in dentistry, he completed training and certification for Invisalign and CEREC/CAD-CAM treatment. Currently, he is active in study clubs reviewing Implant placement and restorations and CEREC / CAD-CAM restorations. He continues to also remain active in many dental and professional organizations, including the American Dental Association, Texas Dental Association, Greater Houston District Dental Society, Academy of General Dentistry, and American Academy of Gnathological Orthopedics. Outside the office, Dr. Moers enjoys being a current active member and past-president of the University Club Rotary Group. On his free weekends, he enjoys fishing at the coast, and spending time with his family. He is blessed with a wonderful wife, three children, and one grandson.